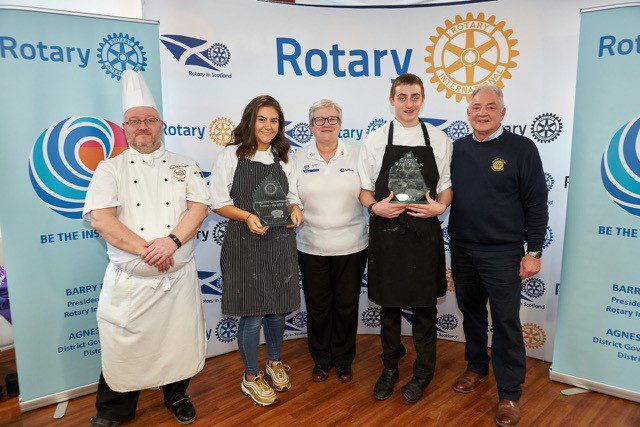 The Rotary Young Chef District Final took place on Saturday 2nd Feb at West Lothian College Livingston and two pupils from Kirkcudbright Academy represented Dumfries and Galloway. 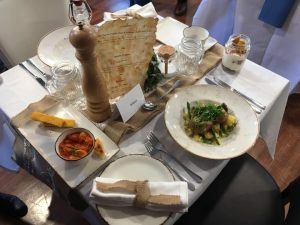 15 year old Maya Johnston an S4 pupil at Kirkcudbright who won the Dumfries and Galloway Young Chef competition at the end of 2018 was joined by D&G area runner up fellow Kirkcudbright Academy S4 student Stephen Dale-Sunley. All the competetors were given 2 hours to prepare and present a 3 course dinner for two. 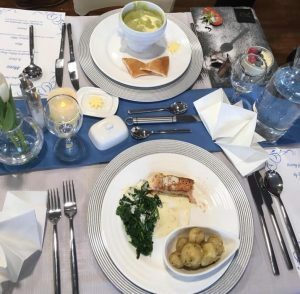 Stephen’s three course menu was Broccoli & Stilton soup to start, a main course of salmon fillet served on a bed of spinach with crushed new potatoes, followed by a dessert of Creamy white chocolate pot. Maya’s Menu was starter of polenta chips with a butter bean ragu, followed by a main course of chicken stuffed with homemade pesto and mozzerela wrapped in parma ham with crushed potatoes and vegtables with a cream sauce, followed by a chocolate coffee tiramisu with a hazelnut praline. Six pupils took part and the judges were very complimentary of the high standards achieved. Stephen was very proud to take first place in this round of the competition, followed very closely by Maya as the runner up. Stephen and Maya now go forward to the Regional Final on Sat 2nd March at East Kilbride.